Hey there, welcome to the day three of the March Neat and Tangled release. Today I have a brand new spring set, Friendly Florals and it's a beauty! To create this card begin with a white cardstock background and black Versafine ink to randomly stamp a variety of the floral icons all over the background. 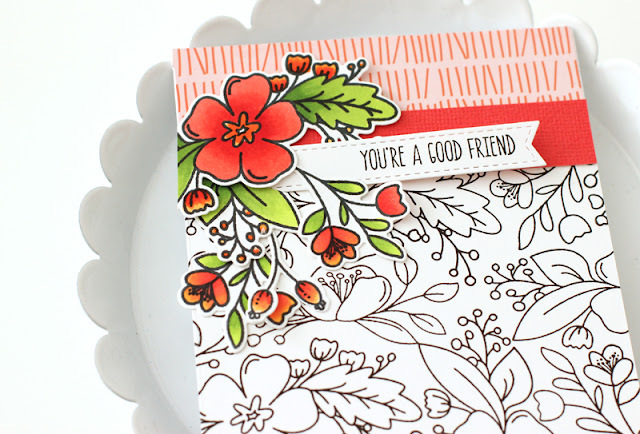 Next, add a strip of patterned paper at the top of the card followed by a coordinating thinner strip of coral cardstock. Stamp a handful of the florals and color with Copic markers. Layer a cluster of the stamped images at the left side of the card. Stamp a sentiment on a die cut flag and tuck into the floral cluster. 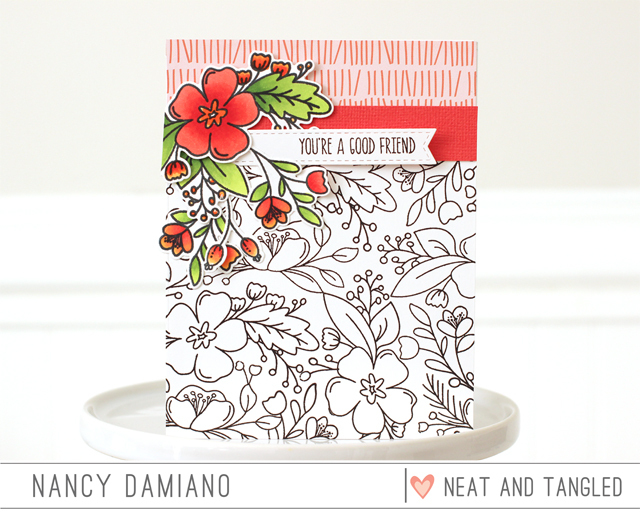 Neat and Tangled will be giving away a Friendly Floral stamp set. To enter, leave a comment below to be entered. Be sure to visit the Neat and Tangled blog on Friday for a list of winners. Good luck and thanks for stopping by! This is gorgeous - love the black and white images as much as the colored focal point. Really loving this set. Wow! Awesome card!!! Love these bright colors!!! L*O*V*E this pretty design you created. Beautiful card! Love the b&w section along with the colored design! Love how you created this gorgeous card! What a sweet pop of color. This would be so great to send out stamped without any color. Reminds me of a coloring page. Love this set so much. Your card is so gorgeous !! Beautiful layout on this card. What a beauty! Love how you left the background B&W and only the outline. Thanks for the wonderful inspiration- such a beautiful card. This is absolutely gorgeous! I LOVE the use of black and white with the color only on the top part of the card! I love how creative this card is....the floral stamped in black at the bottom and then coloring one of the sprays and popping it on the top. I think it's really beautiful! Very pretty with the stamped background. A very innovative use of the stamp set! Love the juxtaposition of the black and white flowers with the colorful images and design. That black and white pattern paper you created for the bottom of the card with the brightly colored flowers is just perfect! Love this design! Fabulous card!! Love the design and the coloring, it is soooo pretty! Love it with this pretty white on black background..lovely card. Love the opportunities to color!